Mike Parcher of Port Alberni tackles part of the technical track on a single-speed mountain bike at the TransRockies Bike Series in June. Port Alberni riders Blaise and Parcher challenge themselves with a 24-hour endurance race in Golden. Jul. 19, 2016 5:00 p.m.
Lee Blais is no stranger to extreme mountain bike racing and when he went to a 24-hour event in Golden last month, it was a challenge that lived up to his expectations. Blais went to the Golden 24 with local rider, Mike Parcher and several friends from Campbell River and Nanaimo. 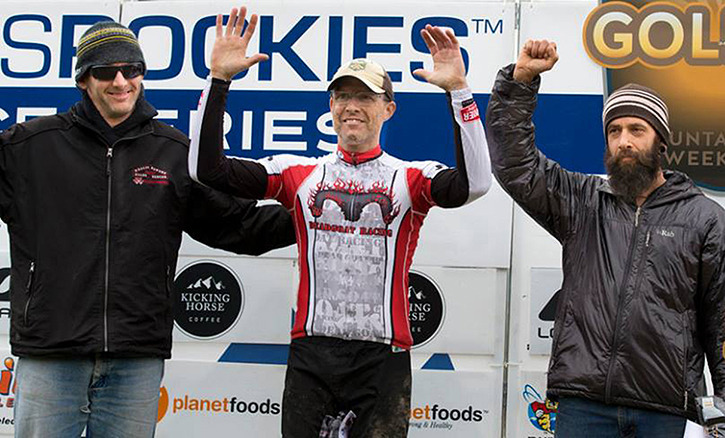 As part of the TransRockies series on June 17-18, it was the first time Golden held the race, which was one of the main reasons Blais decided to go. “I’ve never been there and it sounded like a fun part of Canada to ride,” Blais said. There were options for all levels, including eight-hour and 24-hour courses and categories for teams and solo entries. Blaise and Parcher signed up for the ultimate: solos in the 24-hour race. To up the challenge, they did it on single-speed mountain bikes. The idea was to ride as many of the 14.5 km loops as possible in the allotted time. The trail was predominantly single track with about 500 metres of climbing. For Blais, who took third place in his age category, the most difficult part was the weather. The race started at 11 a.m. and by 4 p.m., the rain started non-stop. Blais said he was cold, sick and could not hold down any food by that point. Parcher said the hardest part was the weather. It was cold with the rain and the temperature got down to below 10 degrees at night. The trail was more technical than they expected and with the rain, there were slippery sections. At 58, Parcher recently transitioned from racing downhill to more endurance-based events, and the two often train together. Parcher ended up placing fourth in his age category in his first attempt at a 24-hour race. “I was very satisfied with fourth,” Parcher said. Both Blais and Parcher intend to continue challenging themselves with similar races.